Around the end of the year, I usually take a look back at my gaming over the previous 12 months. This time around, I decided to graph my board game and RPG sessions for every year for which I have complete data: 2009-2017. I’ve also felt like my board gaming dropped off since I moved to Seattle, where my gaming group plays board games maybe once every 2-3 months, rather than roughly twice a month back in Utah . 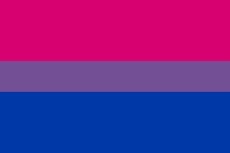 . . but the data doesn’t really support that gut feeling. 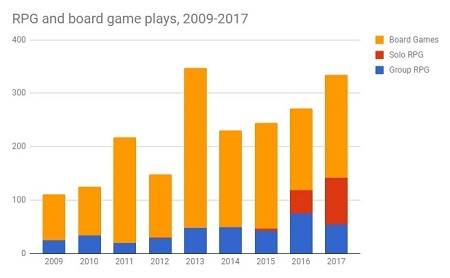 Ignoring 2013, with its +50% spike, I’ve averaged 174 board game plays every year from 2012-2017. The data doesn’t lie about 2017, though — and the data and my feelings on the matter align perfectly: Gaming-wise, it’s been a great year. I’m in my happy place, playing and running sandboxes and zero-prep RPGs, and still fitting in a solid amount of board gaming along the way. See My 51 in 15 for 2015 and My 2014 in games for that year. I thought I’d done one of these for 2016, but I guess I didn’t. I started logging board games in early 2008, but didn’t start logging RPGs until almost the end of 2008. The chart also shows a pretty clear swap that took place in 2016: It was a low year for board games but a massively high year for group RPG play; time for one, broadly, comes from the other.